The story is told of a woman who was married to a man who was harsh and cruel. He constantly placed demands upon her. Each day, before the man went to work, he would give his wife a list of jobs that he expected her to do before he returned home. In the evening, the man would go around the house with his list and inspect what his wife had done. If she didn't complete the list of if she did something poorly, he would become angry with her, scold her, and demand she do better the next day. It didn't take long for the woman's heart to be crushed and her love to be quenched. In time, the woman's cruel husband died. She never thought she could marry anyone again. After some time, the most wonderful man entered her life. He was kind, thoughtful, and understanding. He constantly encouraged her. She was very guarded at first, but his constant love and devotion slowly broke down her walls of resistance. A few years passed, the woman's heart opened up to his love, and they were married. The woman began to live a life that she thought impossible. Each day was filled with happiness. One day the woman was cleaning out her desk when she came upon an old piece of paper. On it was a list of duties written by her first husband. As she read the list, the woman's heart was overcome with joy. She realized that in her new marriage, she was doing everything that was on that list without being aware of it. Nothing she did seemed like work at all. Everything was motivated by joy and the love she had for her husband, instead of by duty and fear. 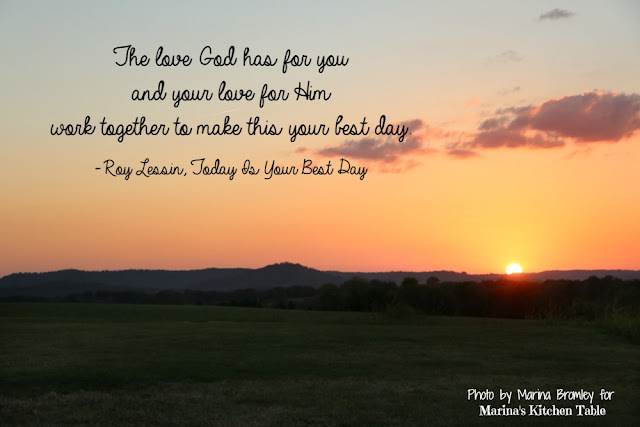 The love God has for you and your love for Him work together to make this your best day. There is no higher, better, or richer way to live a day. This relationship is possible because God loved you first. He didn't wait on you to respond to Him before He showed you His loving favor. His love pursued you when your heart was far away from His. God not only loved you first, but He loves you best. You will never know a love as glorious and generous as the love that God has for you. It is God's love for you that makes you a debtor of His love. Your love debt to God motivates you, not only to love Him in return, but to bring His love to others. Paul tells us to owe no one anything except the debt of love. It is Christ's love that controls you and moves you to respond to Him and to the people He brings into your life. Let all you do today flow out of the joys that come from your love relationship with Him.